If you're looking for a great (and cheap!) hotel in Barcelona, CheapTickets is the best place to find them. 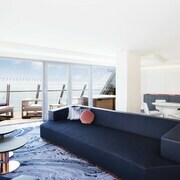 We offer deals on the best 1521 hotels throughout Barcelona. No matter what you're looking for, we have options for you. Grab great rates on the 612 affordable 3-star hotels that are easy on the wallet without sacrificing comfort. Looking for more luxury? Try one of the 397, 4-star hotel accommodations in Barcelona. No matter your budget needs, we've pulled out all the stops to make sure you have plenty of vacation options. Maybe you prefer to search for your hotel deals based on what each hotel offers? For example, let's say you just want to find a hotel or resort that has a pool to cool off in after a long day exploring Barcelona. Scroll down to choose from the 280 hotels in Barcelona that has a pool for guests. Or search for deals on Barcelona hotels offering free wifi or breakfast, non-smoking rooms, and more! CheapTickets is here to be your personal travel agent for your next trip to Barcelona. Get booking today! What hotels in Barcelona offer free wifi access? Are there deals on Barcelona hotels offering free breakfast? Yes! The only thing better than finding a great deal on a cheap hotel in Barcelona is finding one that offers free breakfast. Grab some eggs, a waffle, or some healthy oatmeal before a day full of exploring Barcelona and all that it has to offer. Below are just some of the many hotels that offer free breakfast in Barcelona. Royal Ramblas is a 4.00 star rated hotel property in Barcelona that offers free breakfast. Room Mate Pau is a 3.00 star rated hotel property in Barcelona that offers free breakfast. 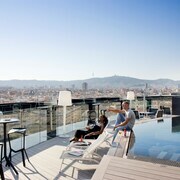 Musik Boutique Hotel is a 3.00 star rated hotel property in Barcelona that offers free breakfast. Hotel Barcelona Universal is a 4.00 star rated hotel property in Barcelona that offers free breakfast. What about deals on pet-friendly hotels in Barcelona? Barcelona is a great place to get outside and explore with your pets in tow so don't leave your furry friends behind. Below you'll find great deals on hotels in Barcelona that allow pets. Don't forget to bring plenty of treats! El Avenida Palace Hotel is a popular, pet-friendly, 4.00 star hotel in Barcelona. Apartments Sixtyfour is a popular, pet-friendly, 4.00 star hotel in Barcelona. Hotel Colon Barcelona is a popular, pet-friendly, 4.00 star hotel in Barcelona. Barceló Raval is a popular, pet-friendly, 4.50 star hotel in Barcelona. 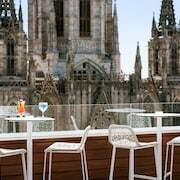 Any good rates on Barcelona hotels with restaurants? Absolutely. Don't want to deal with planning our all your meals on your trip to Barcelona? We don't blame you. Keep the hangry away by staying in one of the 292 hotels that have restaurants. With a room at one of these spots, all it takes to get a good meal is hopping in the elevator. Check out some of the most popular hotels in Barcelona that have restaurants below. Book Aura Park Fira BarcelonaAura Park Fira Barcelona is a 3.00 star hotel and has one or more restaurant options. Book The Gates Diagonal BarcelonaThe Gates Diagonal Barcelona is a 4.00 star hotel and has one or more restaurant options. 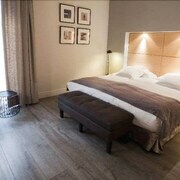 Book Hotel ILUNION BarcelonaHotel ILUNION Barcelona is a 4.00 star hotel and has one or more restaurant options. Book Hotel Barcelona PrincessHotel Barcelona Princess is a 4.00 star hotel and has one or more restaurant options. What are the cheapest hotels in Barcelona with pools? What's better after a long day exploring Barcelona then a relaxing dip in a pool? Finding the Barcelona hotel you need for a bargain! Cool off and unwind at one of our 280 Barcelona hotels with a pool. Browse some of the top deals on these hotels and resorts with pools in Barcelona below, but be warned: You may not want to check out! Olivia Balmes Hotel has a pool and a 4.00 star rating. 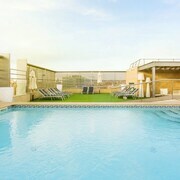 Hotel Sixtytwo Barcelona has a pool and a 4.00 star rating. Gran Hotel Torre Catalunya has a pool and a 4.50 star rating. Andante Hotel has a pool and a 3.00 star rating. What hotels in Barcelona offer parking for guests? Once you've made your way to Barcelona, the last thing you want to deal with is finding parking close to your hotel. Avoid the hassle of parking around the block and carrying your luggage all the way to the lobby by booking one of our hotels with parking. Check out deals on some of the 472 hotels in Barcelona that offer parking for guests. Hotel Granados 83 This hotel has a 4.00-star rating. Happy Apartments Barcelona This hotel has a 3.50-star rating. Petit Palace Boquería Garden This hotel has a 4.00-star rating. Hotel Barcelona Colonial This hotel has a 4.00-star rating. Do Barcelona hotels offer 24-hour concierge services? When you're on vacation, things don't always go according to plan. Travel with peace of mind when you book one of our 290 hotels in Barcelona with 24-hour concierge service. That way you know help is always phone call or elevator ride away. Try H10 Metropolitan. It's a 4.50 star rated hotel in Barcelona that offers concierge services 24 hours a day. Try Gran Hotel Torre Catalunya. It's a 4.50 star rated hotel in Barcelona that offers concierge services 24 hours a day. Try Mercedes Heritage Barcelona Apartments. It's a 4.00 star rated hotel in Barcelona that offers concierge services 24 hours a day. Try Hotel Barcelona Princess. It's a 4.00 star rated hotel in Barcelona that offers concierge services 24 hours a day. What about low rates on non-smoking hotels in Barcelona? Mercedes Heritage Barcelona Apartments This hotel has a 4.00-star rating. Arc la Rambla This hotel has a 3.00-star rating. Hotel America Barcelona This hotel has a 4.00-star rating. Olivia Plaza Hotel This hotel has a 4.00-star rating. What are the cheapest Barcelona 3-star hotel deals? Our 3-star hotels bring you quality accommodations at a lower price point for the perfect, budget-friendly vacation in Barcelona. With 612 3-star hotels throughout Barcelona to choose from, you still have options. Browse our selection below. Vasanta Hotel Boutique. Located in Eixample, this boutique pension is within a 10-minute walk of Casa Calvet, Palau de la Musica Catalana, and Placa de Catalunya. Casa Batllo and Barcelona Cathedral are also within 15 minutes. Hotel Granvia. Hotel Granvia is located on Gran Via between Paseo de Gracia and Plaza Cataluña, and is surrounded by some of Barcelona’s most emblematic and historical landmarks, like the Pedrera, Casa Batlló, Palau Robert, Casa Fargas and Casa Ametller. B-Hotel. Opened in 2005, this minimalist 84-room hotel sits on bustling Plaza de Espana, near the Eixample district and overlooks the former Las Arenas bullring, 2.5 kilometres from Barcelona city centre. Aura Park Fira Barcelona. 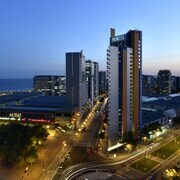 Aura Park Aparthotel is located southwest of central Barcelona, only 10 km (6.2 miles) from El Prat Airport. Guests can walk 6 minutes to Av. Carrilet Metro Station, then ride into town for a stroll down La Rambla, a wander around the Gothic Quarter, and a visit to Gaudi's gorgeous Sagrada Familia. What are the best deals on 4-Star Hotels in Barcelona? Barcelona is full of hotels and it can be hard to narrow down where you really want to stay. Luckily, we've done that hard work for you be narrowing you from 1521 hotels throughout Barcelona, to the 397 4-star hotels in Barcelona. Our 4-star hotels in Barcelona are exactly what you need for your next family trip, romantic weekend, or solo getaway. Check out our most popular deals below. Casa Camper Barcelona: Located in Ciutat Vella, this boutique hotel is within a 10-minute walk of Fundacion Joan Brossa, Palau de la Musica Catalana, and Las Ramblas. Placa de Catalunya and Gran Teatre del Liceu are also within 10 minutes. El Avenida Palace Hotel: This hotel is within strolling distance of Barcelona's Las Ramblas, the Gothic Quarter, the Picasso Museum, and the Museum of Contemporary Art. Negresco Princess: Located in Eixample, this luxury hotel is within a 10-minute walk of Casa Calvet, Palau de la Musica Catalana, and Placa de Catalunya. Casa Batllo and Barcelona Cathedral are also within 15 minutes. Hotel Barcelona Universal: This 167-room Barcelona hotel on Avenida Parallel is less than 1 kilometer from the Maritime Museum, La Ramblas and Old Town. The Paralel metro station is in front of the hotel. What are the best activities to do in Barcelona? Hot Air Balloon Flight with Pick-up from Barcelona: Starting at just $224 per person. Bike Tours Barcelona: Starting at just $30 per person. Scholar-Led Gaudí Masterpieces Walking Tour: Starting at just $126 per person. Scooter Rental in Barcelona: Starting at just $55 per person. Excellent location, loved it. We would go back to stay. Clean and well situated hotel convenient to all types is transportation and walking distance to Placa Cantalunya, the Cathedral, waterfront and many very nice and affordable restaurants. The rooms rather simple but comfortable with tv and very decent baths. Very nice and helpful desk clerks. A good value for the budget minded. Very clean and comforty. Rooms are quite small but the washroom is big.